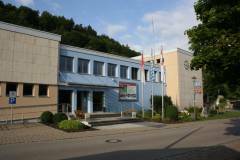 Welcome to the presentation of the municipality of Solnhofen. I am glad that you are interested in our municipality. In a wide loop of the river “Altmuehl”, Solnhofen, with nearly 2000 inhabitants, is situated to both sides of the valley at the slopes. The districts Hochholz and Eßlingen belong to the municipality. The community not only has an interesting past, but also climaxes: Such as juicy meadows in the valley, dry lawn and juniper in the south-sided valley slopes, mixed forest passing up to the hills and, finally, striking rock like the distinctive "Twelve Apostles" near the district of Eßlingen. Solnhofen enjoys a good reputation world-wide as a supplier of the only suitable stones for the lithography (lithography, invention by Alois Senefelder about 1798). 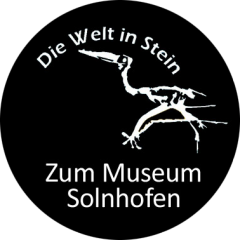 An exhibition of lithographies shows the great possibilities of the lithography in the artistic domain and as an archaeological discovery of the archaeopteryx (Archaeopteryx). The museum in the city hall, based on the most modern aspects, shows fossilized animals and the flora from the Jurassic time. Especially remarkable is the voluntary engagement of our citizens, who are active within many associations and organizations and collaborate during the creation of the municipality itself. Our advanced municipal management, our technical department and our day-care centre named "Jungle Gang", gets on as a modern service enterprise. If you want to know more about us, simply get in touch with us - We help you with pleasure. Please also have a look to the attched flyer in the download area below.